I hate to be one of those people. But I can’t help it. This is supposed to be an educational site, and one of the best ways to improve as a writer is to see someone’s writing broken down. There’s nothing more useful than watching the process of prose being improved incrementally with an explanation. No. Even her books for adults, written under the name Robert Galbraith, have terrible prose style. Her sentences contain missing clauses, poor construction, confused tense and point of view, imprecise descriptions, and poor word choice. From as far back as I can remember, I’ve always said that J.K. Rowling isn’t that great of a writer from a prose standpoint. Harry Potter does follow the standard Hero’s Journey, and so it is entertaining to read. But I hope she’s humble enough to admit that her fame is mostly luck. She wrote a story that resonated with the zeitgeist at exactly the right time, and that has very little to do with writing quality or marketing skills or anything under one’s control (if you disagree, consider Fifty Shades of Gray, then ask yourself how much your disagreement stems from me saying this about a beloved story from your childhood). I’ve often pointed to the first Harry Potter book as an example of her low-quality writing. It reads like an early career first novel. And that’s fine, because it is. Okay. But let’s be honest. It’s much more likely that she just got better as a writer as she wrote more. This is a simple application of Occam’s Razor. I never read the final Harry Potter book to know if the prose style grew into something reasonable. In any case, it doesn’t matter. We have lots of books, published after that series, aimed at adults to examine. We can settle this once and for all! I’m not a big mystery reader, and so I was considering doing a “Year of Mysteries” next year for the blog. 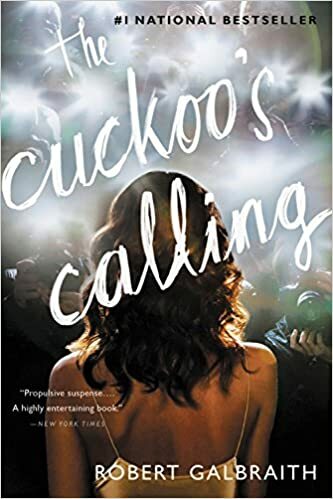 I picked up The Cuckoo’s Calling by Robert Galbraith (J.K. Rowling) to read as the first book. It’s kind of shocking to me that a major publisher would let this get through without serious edits. I was so distracted by the prose errors I couldn’t even focus on the content. I know this isn’t something most people notice, but it serves as a good reminder that J.K. Rowling is not a good writer. She’s famous. Those are different things. I was going to break down some of the prologue, but I thought people might consider that unfair. Prologues are often bad, even when handled by the greatest writers. This is the opening sentence, and opening sentences tend to be more polished than the paragraphs that follow. This sentence reads like a first-year creative writing student attempting to impress a teacher by making things needlessly complicated. It reads like a student who hasn’t learned that this is exactly how agents and publishers can tell you’re still an amateur. The real way to show maturity as a writer is to be precise, concise, readable and still get all the same information across. The first thing is the lack of precision in language. She words it so the “years” are the one “seeing.” This is nitpicky but also confusing and imprecise (if you don’t understand why, it’s because only a conscious thing can “see” something). Also, we begin with a subordinate clause. This is, by definition, beginning with inessential and/or unimportant information. The clause tries to cram in way too much information. There’s no need to force in her age to this mess of a sentence because this will naturally become clear later. I’ll concede there is wiggle room for personal style, but in this case, there are too many “glue” words doing no work. For one, “that” can be eliminated without loss of information. Then there’s the tense: “had seen,” “had never before,” “would remember the coming day.” Are we in the past tense? Is the narrator omniscient or close third? I’ve read this sentence a dozen times, and I’m still not sure how she is certain about remembering something that hasn’t happened. Though the gist is obvious, it’s extraordinarily confusing if you take it as it is written. The sentence lacks clarity, precision, and readability. Robin Ellacott woke with the certain knowledge that she would remember the coming day for as long as she lived. Even all you die hard fans have to admit that you read my version and instantly understood it. If you’re being honest with yourself, you didn’t understand J.K. Rowling’s version on the first attempt or maybe even the third. Justification for my edits: One should draw the reader in as fast as possible. This straightforward edit does this by directly raising the question in the reader’s mind: why? Rowling’s version obscures this question by confusing the reader with tense switching, needless information, and excessive words. (I kept the awkward past/future thing, because I wanted the edit to be an actual edit and not a rewrite). She has the whole rest of the book to let her prose get fancy (and confusing). At this point, I was a little concerned the entire book would be in past perfect (sometimes continuous) tense. She wrote the prologue this way and then several pages of the first chapter in this tense. She needs to switch to the simple past already. It’s beyond tiring. Because of the confusing nature of the first sentence and now awkward tense usage, it’s unclear to me if this proposal is the day she’ll remember forever or if it referred to the next day. Everything is so wordy and passive: “that he had been,” “just had eaten dinner,” etc. For example, remove “just had eaten dinner” completely. This is doubled information. They were at a Thai restaurant shortly before midnight. It’s obvious they went there for dinner. What else would they have been doing? Just hanging out there, smelling the delicious food, chatting, but not eating dinner? This might be a British idiom, but there seems to be a clause missing in the second sentence (despite it being more than double the length it should be). Again, the gist is clear, but the sentence is not. He would have proposed if it weren’t for the silent couple eavesdropping on them. The words, as written, don’t say that. Read the sentence carefully several times. I can’t make sense of it. I think it’s actually both a sentence fragment (missing a clause) and a run-on sentence simultaneously. There’s no award for sneaking in the worst sentence you can to a book. Shortly after midnight, her long-term boyfriend, Matthew, proposed to her under the statue of Eros in the middle of Piccadilly Circus. He confessed he would have popped the question in the Thai restaurant—if only the silent couple beside them weren’t eavesdropping on their entire conversation. Obviously, this new version isn’t perfect. But these simple readability changes show how far Rowling has to go to get from her “final draft” to solid prose style. Later, the narrator calls the proposal “the most perfect.” What does that mean? There aren’t levels of perfection. I think it’s supposed to be in Robin’s voice, but then the early narrative omniscience makes no sense. These first two chapters are confusing on a sentence-by-sentence level, all over the place in terms of tense and viewpoint, and messy in terms of prose style. She lacks the precision, clarity, and readability of any reasonably mature writer. If this is how Rowling writes for adults, no one can say she is a good writer. This has now been definitively settled, and if anyone wants to argue otherwise, go ahead. You’ve got a tough job because you have to find me something she’s published that rises above this. But I hear the pushback already. One can break the rules of prose style and be a great writer. Yes, but when a great writer breaks the rules, the prose becomes better than it would have been if the rules were followed. In this case, we only found confusing sentences and constructions that would have been made better by following standard prose style. Wait, wait, I hear you saying: she proved her work resonated with people, and so none of these things matter. I completely disagree. One can be a great storyteller without being a great writer (cough, Steven King). You have to remember, her popularity came about initially because of 10-11 year olds. I was one of them. Of course, I didn’t care about any of this stuff. The book had magic. People will overlook prose mistakes for a great story. This doesn’t mean the writer is good at writing. I thoroughly agree with you that Rowling isn’t a good writer, just a lucky one. I don’t quite agree with your rewrite of the first sentence, though. I think it’s important to give the age of the character straight away because somebody’s opinion on what counts as a memorable day for the rest of their lives depends a lot on how old they are. If a young teen thinks that the next day is going to be memorable forever, it means something very different from a 40-year old thinking the same, and again something else if an 80-year old thinks that. I do agree that Rowling’s sentence is way too clunky for a beginning sentence. In the twenty-five years of her life, Robin Ellacott had seen moments of drama and incident, but never before she had woken up like this, knowing she’d remember the coming day for the rest of her life. It contains all the information, but it’s far more readable. Of course, there are possible variations on this, and you may like something a little different. I have to disagree. I find the first line quite pleasing. For one, the “years have seen” phrasing is quite idiomatic in English. For example, a quick Google search leads me to the sentence from the Economist: “Recent years have seen numerous attempts to reform and revitalise the profession.” It would be very strange to object to this on the grounds that years are not conscious beings and cannot see. I don’t hold magazine writing done on a deadline to the same prose standards as a novel. Colloquialisms, imprecise language, and cliche are all much more acceptable in the former. The two sentences also have some major differences. The Economist sentence is short and to the point with the “recent years” as the clear subject. There’s no room for confusion. The Rowling example has “Robin Ellacott” introduced first and then switches the subject to the “years.” It then saddles the years with many human traits, not just “seeing.” This is strange and confusing when it’s Robin Ellacott’s life that had drama and incident not the years. The phrase has to be taken in context. Even good writers write some bad stuff from time to time; just as otherwise great actors sometimes have a bad performance. To say JK Rowling is a “bad writer” — or is lucky — is reductive, at best. The act of “writing” encompasses so many elements: plotting, character development, world-building — and, yes — prose. A more dispassionate analysis might note that, in the Potter books, Rowling is a master plotter and a master world-builder. She’s also quite good at setting up and releasing tension, even if it’s sometimes at the expense of more nuanced characters. I think saying she was “lucky” is to somehow discount or ignore the evident mastery — I’m going to use that “m-word” again — with which she achieves very detailed imaginative worlds, bound by increasingly complex plots. I think it’s these worlds and plots that people are captivated by. As for prose, the Potter books — unlike the faux Henry James writing cited above — are clean, clear, and visual. To say she is “lucky” is something of a baseless claim: unless you say — to use a rather fanciful example — chocolate was lucky that people liked it, thus removing the merit from chocolate and attributing it to a fault in people’s taste, which seems a long trip from a more obvious conclusion: that there’s something in chocolate itself that people are responding to. She is successful because there are some thing she has done exceptionally well. To say that she is “bad” — simply because she is not perfect — strikes me as disingenuous. And when all the debate-room antics are said and done, her books have been consumed by millions: which I think speaks to her merits as a communicator. You are vastly underestimating the role of luck in the creative world. I’d say this about anyone who has “made” it, no matter how good they are. You seem to be conflating the ideas of luck and skill. You should check out the book Outliers by Malcolm Gladwell. There’s probably few people as hardworking and talented and smart as Bill Gates, but I’d still say it’s pure luck that he became so mega-rich, too. There are hundreds of people as talented, if not more, than Rowling, who have produced excellent books. But those books just didn’t hit the zeitgeist right or weren’t read by exactly the right groups of people or were dismissed by an agent who was hungover that morning or some politics of a publishing house wanted to push a slightly different angle that year or whatever. The fact that those books didn’t make it, and Rowling’s did, is the definition of being lucky. Sometimes making it as a writer is deserved; sometimes it’s not. But one thing is certain: it’s ALWAYS luck. As I said, if you ask her, I’m sure she’ll admit it, too. So she doesn’t need hyper-fans coming to her defense and pushing a narrative about the industry she doesn’t even believe in.